Home Walt Disney World Resort Vacation Information Walt Disney World Theme Parks and Touring Information Hidden Gems at Walt Disney World Pirates, Ahoy! Pirate experiences have always been in the Disney parks. 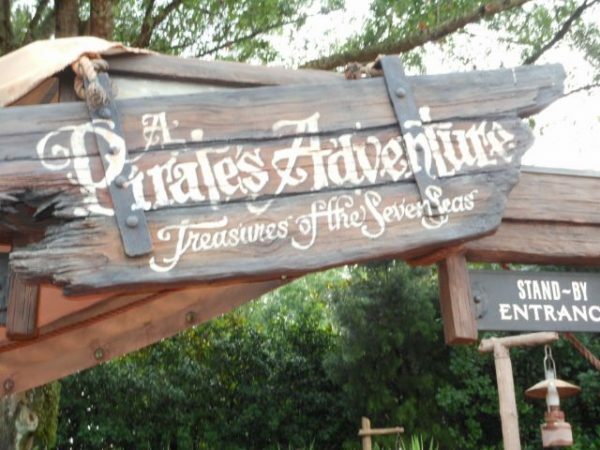 Pirates of the Caribbean opened in Disneyland in 1967, and each Disney Park’s location around the world has followed suit with a similar pirate themed ride — Walt Disney World in 1973, Tokyo Disneyland in 1983, and Disneyland Paris in 1992. Even Disney Cruise Line hosts an extremely popular Pirates in the Caribbean night on Caribbean sailings including the first fireworks at sea! But nothing has made pirates more popular than the Pirates of the Caribbean movie franchise. The first movie in the series, Pirates of the Caribbean: Curse of the Black Pearl, was released on July 9, 2003. Since then the pirate craze has not only launched more movies, but many places to find pirates in the parks. 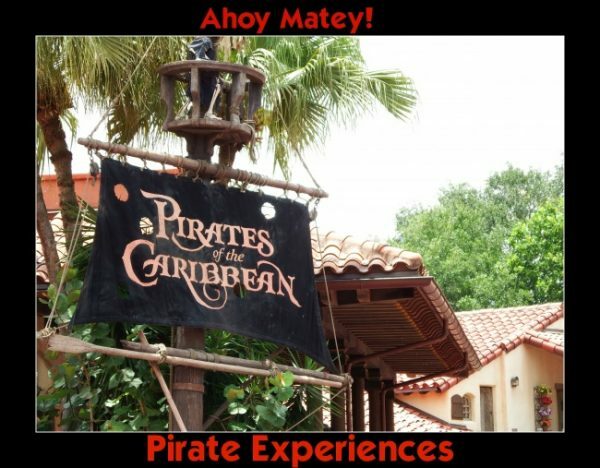 Are you in search of Pirate experiences in the parks? Look no further, you’ve found the treasure trove! There are Pirate experiences everywhere. Pirates of the Caribbean ride. Of course, this is the classic water ride that, along with its counterparts in other Disney locations, inspired the pirate craze. It was updated in 2006 to include several scenes with Captain Jack Sparrow and one with Captain Barbosa, both characters in the movies. A Pirate’s Adventure: Treasures of the Seven Seas. This is an interactive game played throughout Adventureland. Guests who sign up to become one of Captain Jack Sparrow’s newest recruits. Five different pirate maps lead players on raids seeking hidden treasures while fending off Captain Jack’s enemies. The Pirate’s League. Children of all ages can get a pirate makeover. Guests receive a pirate name, then begin their transformation into one of four pirate (or mermaid) looks. Costume pieces are available for purchase, or bring your own accessories to complete the look. If you want to book The Pirates League for yourself or your children start the process by calling 407/WDW-CREW for reservations up to 180 days in advance. Captain Jack Sparrow’s Pirate Tutorial. Captain Jack and crew lead kids in the basics of becoming a pirate. This show is held several times daily in Adventureland, across from the Pirates of the Caribbean attraction. Check your times guide for showtimes. Pirate Adventure Cruises. Children ages 4-12 can participate to find hidden treasure. 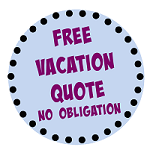 There are four different adventures leaving from different resorts. Disney’s Pirate Adventure is at Grand Floridian Resort; Islands of the Caribbean Pirate Cruise is at Caribbean Beach Resort; Albatross Treasure Cruise leaves from the Yacht Club or the Beach Club Resorts; and Bayou Pirate Adventure sails from Port Orleans Riverside. Pirate Rooms at Caribbean Beach Resort. 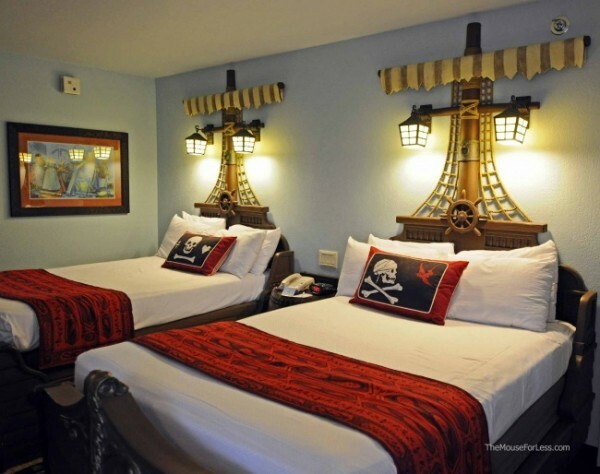 Pirate-themed guest rooms are available. Pirate and Pals Fireworks Voyage. Sail the Seven Seas Lagoon in this pirate-themed cruise. Your night will end with a water view for the Wishes Nighttime Spectacular at Magic Kingdom. Pirates of the Caribbean ride. 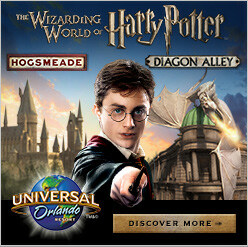 The original attraction. This is the last attraction that Walt Disney himself had a hand in designing. It is a wonderful ride, longer and different than the Walt Disney World version. 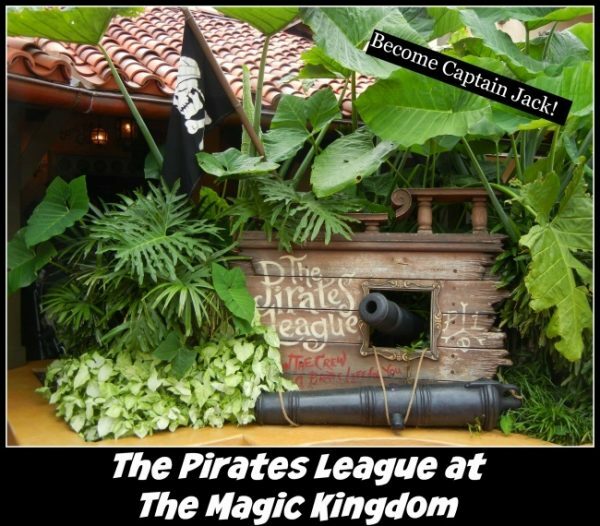 Disneyland’s version of this ride was updated in 2006 to include Captain Jack Sparrow in a few scenes. The Pirate’s League. Children of all ages can get a pirate makeover complete with a pirate name and transformation into one of various pirate looks. Costume pieces are available for purchase, or bring your own accessories to complete the look. Look out for Pirate Night on select Disney Cruises. These special sailings are great for a swashbuckling adventure on the seven seas! Guests can enjoy a special party complete with pirate grub. 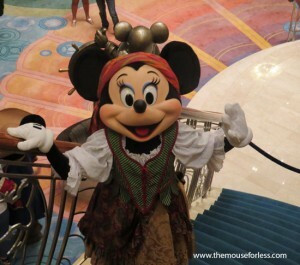 All the entertainment becomes pirate themed, even Mickey Mouse gets in on the fun by dressing up like a pirate. To make the experience even more grand, guests can visit Bibbidi Bobbidi Boutique, which has been overrun with pirates for the night, to get a special pirate makeover. This is an immersive and fun way to connect with your inner scalawag!